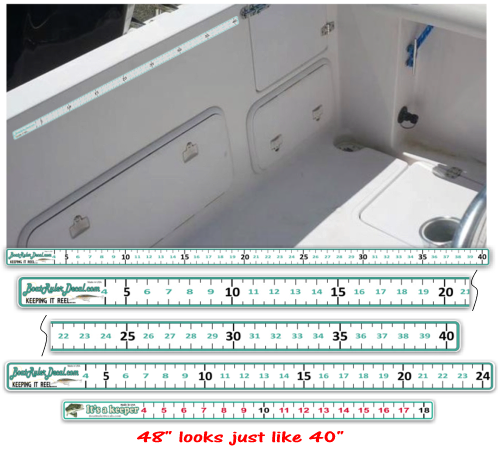 High quality boat ruler decals come in two sizes. If you don't have one, it's time to get one now! Ruler Size : Size 18" (-$5.00 ) Size 24" (-$4.00 ) Size 40" (-$2.00 ) Size 48"
Our Boat Ruler Decals are made from high quality easy to install air release vinyl material. All Boat Ruler Decals are laminated with a clear protective film which helps extend UV fading and helps prevent abrasion. See the picture below for sample. 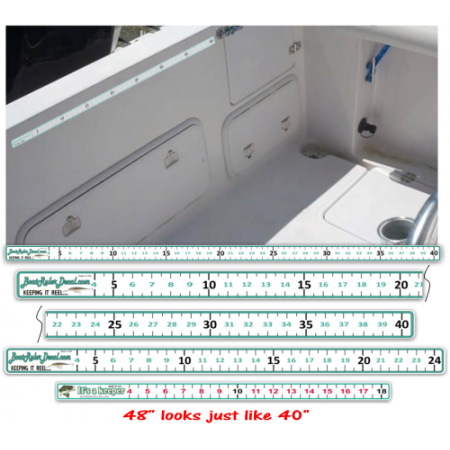 Our Boat Ruler Decal comes in three length's. The popular 40" design and now a 48" , 24" and 18" great for the freshwater fishing boats, canoes etc. All sizes can be cut to any length to fit your application area. Also we offer custom printed Boat Rulers for resellers and promotional give aways. Visit that product to design online or upload your logo. Qty. discount apply's to min. order purchase.